Metadata is a summary of basic information about data. A metadata of a discipline shows you the essential info about that specific discipline. Different disciplines use different data standards. A website metadata shows you the title, description, social media handles, og tags, etc. There are many online tools to extract metadata from a website or webpage. In the website metadata, you get unified information about the website whereas, in web page metadata, you get that webpage specific information. In this article, I covered a free API that can extract both, website metadata and webpage metadata. So, let’s get started. Get Meta is a free API to extract metadata from a web page. This API has a landing page where you can access it easily. On this page, you can type the website or URL from which you want to extract the metadata. To get the metadata of a web page, simply type/paste the URL to that page in the text box next to the “try”. After your input, click the “Get Meta info” button to get the metadata information. Now, as all this information is in raw JSON format, it might be hard to understand for people who are not familiar with programming and JSON format. If that’s the case, you can use JSONView (Chrome Extension) or CodeBeautify (Website) to make the metadata output well formatted and easy to understand. 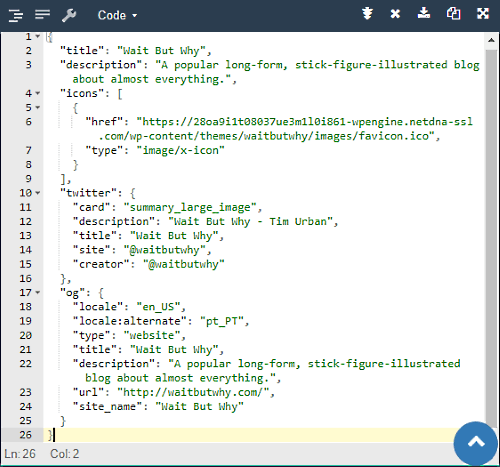 Here is an example of how these tools automatically add formatting to the raw JSON data and make it easy to understand for everyone. As you can see, in the above (Output) screenshot, the data is congested and confusing whereas, in the screenshot attached below (from CodeBeautify), the data is in proper formatting. Extract metadata from a web page using Get Meta here. Get Meta is a handy tool for data scraping. It is a simple method to get meta information from a website or webpage and doesn’t have any limitation.